Cal Mag nutrient additive for plants will combat plant deficiency symptoms such as leaf curl, stunted growth and bud rot. These problems are common in fast growing flowering plants especially where poor quality waters are used. Works as both a preventative and cure for annoying problems like leaf yellowing, leaf curl, stunted growth, withered fruit-set and bud rot. 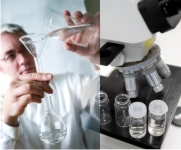 Ca-Mg-Fe excels where poor quality waters are used, or when nutrients are subject to volatile changes in pH and EC. Ca-Mg-Fe will “protect” the nutrient against high pH spikes in the range of 6.5 to 10. Background: Ca-Mg-Fe is designed specifically for fast-growing, light-loving plants, especially where growing occurs under HID lighting. Ca-Mg-Fe is a fully soluble and super concentrated solution of refined calcium, magnesium and iron chelates. To ensure protection against a large spectrum of deficiency symptoms, Ca-Mg-Fe also contains high levels of essential trace elements such as copper, manganese and zinc chelates, plus molybdenum and boron. Monitor plants closely for symptoms of nutrient deficiency. These symptoms can provide a valuable forewarning of serious problems within the growing system. Be aware that there are many factors that cause nutrient deficiency symptoms in a plant. The nutrient itself is usually not the cause. 1. Stunting of growth: As all “essential” nutrients are simultaneously required for healthy growth, this symptom can be attributed to a deficiency in any one or more of them. 2. 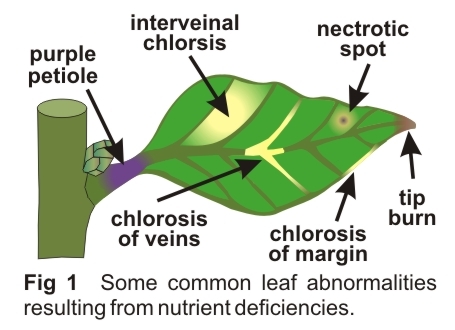 Chlorosis & interveinal chlorosis: Chlorosis can result in the whole plant or leaf turning light green or yellow. It can also be more localized. For example, yellowing of the veins themselves or between the veins (“interveinal chlorosis”). Chlorosis occurs due to plants being deficient in elements required for photosynthesis or chlorophyll production. 3. Purple / red discoloration: This often occurs on stems or along leaf petioles, veins or margins. It occurs due to abnormal levels of anthocyanin that accumulates when plants are stressed. These symptoms can also be caused by physical stresses such as cold, drought and disease. 4. Necrosis: Generally happens in the later stages of deficiency where the affected plant part becomes stressed to the point that it becomes brown and dies. Poor quality (or few) buds, flowers or fruit. Distorted leaves i.e. cupped or twisted. A key indicator for identifying nutrient deficiency is whether the symptoms are occurring in older growth, younger growth, or both. Mobile elements are able to move out of older leaves and into younger plant parts when a deficiency is present. Hence the symptoms usually occur first in the older (usually lower) leaves. Mobile elements include N, P, K and Mg (see diagnostic flow chart). In contrast, immobile nutrients are not able to move quickly from one plant part to another. Therefore, deficiency symptoms are initially most obvious in younger growth (usually higher up the plant). Immobile nutrients include Ca, S, Fe, Cu, Mn, Zn and B (see diagnostic flow chart). Insufficient EC or feed frequency. In recirculating hydroponic systems, the nutrient is discarded too infrequently. Inappropriate nutrient pH: Causes certain nutrient elements to become unavailable for uptake. Excessive humidity: Hinders the distribution of nutrient throughout the plant. Signs of pests or diseases: Their presence can produce symptoms that are similar in appearance to nutrient deficiency symptoms. For more see page 67 of the FloraMax Hydroponics Manual.